Is an all natural, 100% triple milled plant derived mineral. 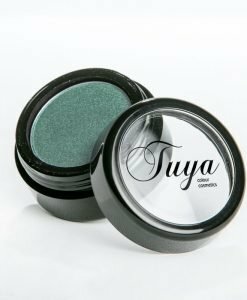 Rich and intensely pigmented to create depth, definition, dramatic and amazing special effects. An easily blendable lightweight formula that glides on with a silky smooth application and an exquisite velvet texture. A choice of finishes include Bold, Matte, Satin, Sheen, Shimmer and a natural light reflecting colour. Perfect for any skin type including extremely sensitive skin. Application Technique: Using appropriate shadow brushes apply lightly and build to desired intensity. Tips: Blend two or more shadows to achieve “Signature Colour”. Use dry for subtle shades and damp for a more defined look. Magical on lips under or mixed with Tuya luscious lip glaze. May contain Iron Oxides: C177491, C177499, C177007 and C177492.